5. a Y-shaped cable, rope, or chain, used for holding, towing, etc. 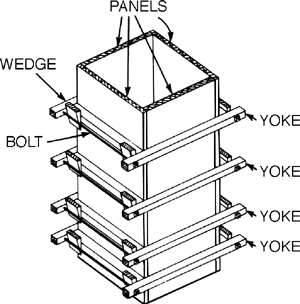 An arrangement of members used in formwork which encircles beam or column forms to secure them together and prevent movement. What does it mean when you dream about a yoke? A horizontal member forming the head of a window frame. A clamp or similar device to embrace and hold two other parts. Piece of ferromagnetic material without windings, which permanently connects two or more magnet cores. A bar of wood used to join the necks of draft animals for working together. A slotted crosshead used instead of a connecting rod in some steam engines. Two or more read/write heads that are physically joined together and move as a unit over a disk, so that it is possible to read from or write to adjacent tracks without moving the head. The horizontal member forming the top of a door opening; a doorhead. 1. A horizontal framework around the form work for a column. 2. The horizontal piece forming the head of a window or door frame. 3. In plumbing, a two-way coupling for pipes, in the shape of the letter Y. The control column of a large aircraft, including the control wheel or the ram's horn. Back-and-forth movement of the yoke operates the elevators, whereas sideway movement operates the ailerons.